I wasn't sure if I would like reading a memoir. I'm not big on celebrity gossip or knowing what is going on in everyone's lives. I'm a private person and tend to respect that privacy for others. But I loved the Sonia's writing when I read In the King's Arms (see my review). And I've read so many books set during WWII, but most of them stop at V-Day. So I was curious about what life was like for survivors of the Holocaust and the generation that came after them. Again, I was left breathless by Sonia's writing - there's a simplistic beauty to it. There is nothing super flowery about the words she chose or in the sentences she constructed. Yet, when taken all together, Sonia has weaved a simple, but beautiful, tale of an immigrant family. It is a reflection of the life she lived - no need to put on airs. While I reading The Watchmaker's Daughter, I wondered what makes people write memoirs (or read them for that matter). My life is pretty boring, who would want to read about it? Then for those who have something shocking or traumatic in their life that would make the story "exciting", who would want to write about it for the world to read? As Sonia says in the closing pages, she wrote The Watchmaker's Daughter to honor her parents, the lives they lived, the love they shared. They lived a simple life fulfilling the American Dream of life, liberty and the pursuit of happiness. 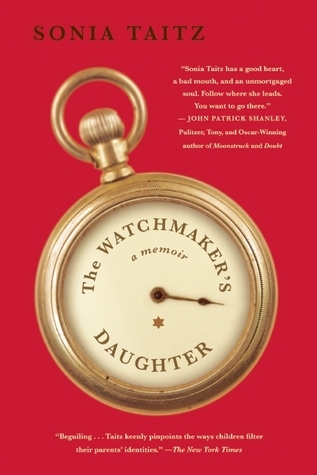 Reading The Watchmaker's Daughter was like getting a look at the story behind a Norman Rockwell painting. Thank you for this moving review. I am especially touched by your words "Sonia has weaved a simple, but beautiful, tale of an immigrant family." I'm glad my parents fulfilled that American dream of life, liberty, and the pursuit of happiness. I'm glad they raised me here, so I could grow up to write about them. And I'm glad to have people like you read and understand all of it.